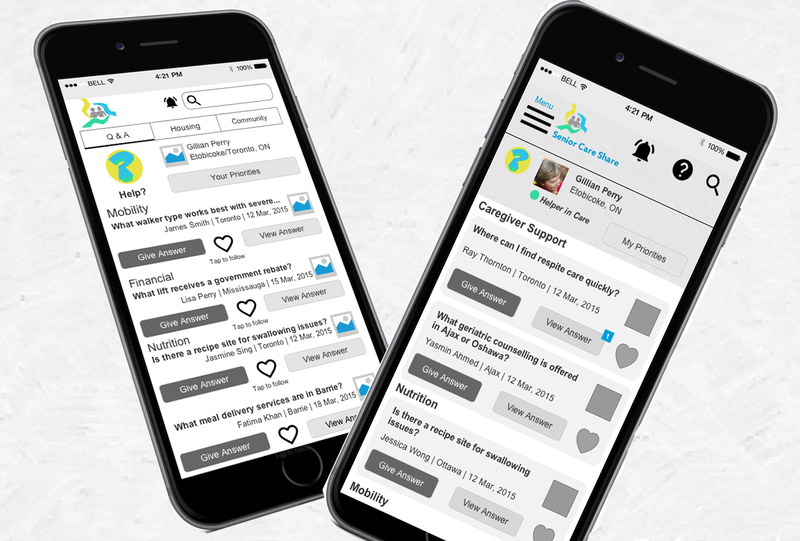 Against what often felt like all odds, my team and I finished a prototype of Senior Care Share — a niche social network for caregivers. To some extent, it’s like a newborn — alive but ‘sleeping’ most of the time and with only the inkling of a fully animated personality. Fortunately, my concept was an easy sell to anyone who was within or close to my target audience. However, with interest comes ideas and there was plenty. What about a live chat? Online seminars? People ranking products? Giving commercial entities a piece of the action? Research, such as comparative analysis, audience needs’ assessment and optimal card sort, played an invaluable role in weeding out component contenders and uncovering gaps. These insights helped me set a sane scope of three modules: a Q & A forum (versus a live or open chat); a facilities review; and a section for rewarding participation and nurturing the community. As I’m still green at UX and a perfectionist, I scour the Internet for best practices on the shape, position and size of every element when faced with a wire frame task. This dilemma leads to ‘writers’ block’ but fortunately I found a UX mentor who encouraged my early ideas and designs, nudging me forward with a few principles at a time. I also engaged a team member, initially pegged as an editor, to take UX ownership of one module, which eased the load. His work also gave me new ideas to adapt and iterate across the platform. My initial plan was to complete wire frame in either Axure or Omnigraffle and then transfer to a specific prototyping tool like Invision. When my mentor suggested completing it all in Axure, I thought I’d found a ‘shortcut.’ I quickly learned how wrong I was. I signed up for Axure training videos to help learn this tool, while using it for these critical steps. My colleague stayed with Omnigraffle and it took a few extra steps to merge the two wire frame types into a unified look and feel. Fortunately, I was able to cut and paste sections over, which I knew were not perfect but looked blended through most eyes. I also cut corners by opting for the simplest interactive technique: linked pages/widgets, which proved effective to my surprise. Before this experience, I envisioned a prototype as something more robust with more fully formed content and crystal clear transitions…but time ran out. Like a newborn that’s thrust into the world after nine months to be raised by ‘a village,’ there’s a point where a concept needs to take form and evolve with a community’s input. Without a forced schedule, ‘my baby’ might be have been internally refined forever, possibly with lame limbs and extra appendages. With a prototype in place, I now need to explain less and the feedback I receive is focused, primarily within scope, and helping this baby grow.